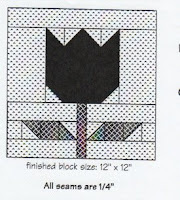 Okay, so this pattern has been sitting on the counter in my sewing room since the day I saw my tulips pop out of the ground. Now I've got to make a few blocks. 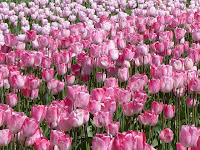 I guess I need to raid my stash of brights and blenders and make a batch of Pink Tulip Squares. But I really want this!!! Since it's so pretty outside, I thought I share a photo of my sweet tulips in my front yard. I only have a few. I just received my green 2 inch strips for my on-line strip swap. Wow! Did I get a nice selection of greens. Thanks to all you ladies that participated in this swap. Now I've got to get going on this quilt. Here are some pictures of the progress I am making. I just finished the binding on my Broken Dishes quilt today. Made from a ton of my green scraps and green Chanteclaire fabrics called "The Color of Money". Believe it or not, I am using it as a tablecloth for my kitchen table. My friend says I am nuts. Don't I worry about getting stains on it? I told her that I don't make them as heirlooms and I want to enjoy all my quilts now. Besides my husband loves to have a quilt on the table all the time. He said "If you make 'em, I'll pay for the quilting." Isn't he the greatest? Remember last week I said I was waiting for snow? Well, we got some. Here is a picture of my house. I just love 2-3 inches at a time. It was so pretty and quiet outside while it lasted. Now it's 81 degrees in the South. I had to put my air conditioning on in my sewing room. It's on the third floor and it gets kind of stuffy as soon as the weather gets warm. I now know that I am addicted to making string quilts. I love making color controlled baby string quilts. I use the pages from phone books that just keep appearing on my front porch. Don't they know that I only want the Real Yellow pages? Well I start with about 25 pages torn out from the book. Cut them into 7 1/2 inch squares. I raid my stash of string and scraps. Sew my fabrics onto the paper, iron, repeat this process with each strip, square up my block and viola, I've got my string block. Today I made two. A sweet 1930's Aunt Grace and a Blue & Yellow. Listening to my favorite country radio station, I just sat and kept sewing. After two days of raining and now waiting for our next snowstorm, I had the most enjoyable day. questions or comments? I love email. Wife, married. Mother of 3. 3 grandkids too. 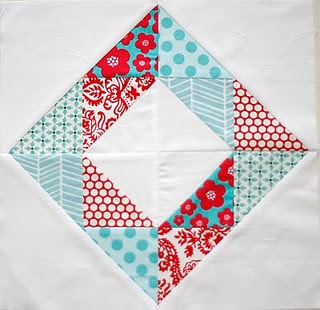 I ♥ quilts a lot!